Since the body is a temple of the Holy Spirit, the Catholic Church has always set aside ground that is blessed and consecrated by God for the specific purpose of providing Christians with a dignified and holy resting place. The sacred nature of cemeteries is directly related to the Church's belief in the resurrection of the body and the final consummation of the world. 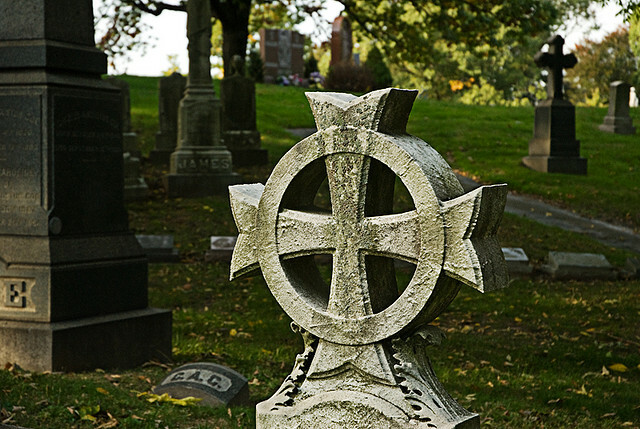 Baptized Catholics may be buried in a Catholic cemetery. Non-practicing Catholics, or Catholics who may have joined another Christian denomination, also deserve the prayers of the Church. Likewise, Non-Catholic spouses and other family members of Catholics may be buried in a Catholic cemetery. Many Catholic cemeteries have a reserved area for the burial of unborn children. A Catholic cemetery is a place that brings together a number of elements of the Church’s pastoral mission: the proclamation of the Gospel to arouse faith, examination of the reasons for belief, celebration of the Eucharist, integration of the church community and apostolic witness. Catholic cemeteries exist because of our belief in the resurrection of the body, in some new shape or form, at the end of time. If there was no promise of resurrection and eternal life, there would be no need for Catholic cemeteries. The Church provides cemeteries to carry out the sacred religious functions of burial and to care for the resting places of the deceased. Just as the human body deserves to be treated with respect and dignity in life, so should it be treated in death. As a place dedicated and/or blessed for the burial of the faithful, it becomes identified with the local church and gives witness to the faith of those who are buried as well as to the faith of their families. A Catholic Guide to end-of-life decisions. When my loved one dies, whom should I call? We recommend your first call be to a funeral home. We find it much easier for families to coordinate funeral services with the parish when a funeral home is directly involved. When are funeral Masses offered? 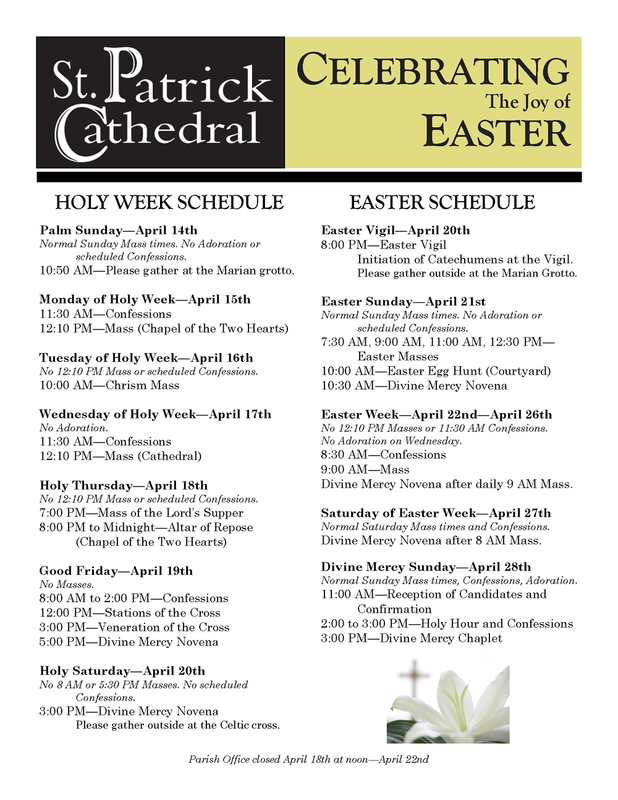 Based on availability, the Cathedral will be available for a funeral Mass every day of the week with the exception of Sundays, Holy Days of Obligation and during Holy Week. The preferred time for a funeral Mass is in the morning, reflecting the theme of resurrection. During the week, the latest a morning funeral Mass can be scheduled is 10 a.m. due to our weekday Mass schedule. Who can have a funeral Mass? Every Catholic, unless specifically excluded by the norms of law, is entitled to a Catholic Funeral Rite. A child who dies before baptism or a stillborn or miscarried child may receive a Catholic Funeral Rite if the parents intended to have the child baptized. Catechumens may also be given Catholic Funeral Rites. Can a non-Catholic spouse be buried from a Catholic Church? Yes, if the non-Catholic did not have a church of his/her own and the Catholic family member requests it, the funeral, including the Mass, can be celebrated. Can a divorced, remarried Catholic or one who committed suicide have a Catholic Funeral? Yes. Such circumstances of themselves do not exclude the possibility of a Catholic burial. In individual cases the pastor of the Cathedral should be consulted. Both burial and cremation are permitted for Catholics. Which is the preferred option? The Church clearly says that while cremation is permitted, it doesn’t enjoy the same value as burial of the body. The Church prefers and urges that the body be present for the Funeral Rites if one does choose cremation. Cremated remains need to be treated with the same respect as we would the body of our deceased loved ones. They need to be inurned into the ground or placed in a cremation niche.